Israeli forces continued with systematic crimes in the occupied Palestinian territory (oPt) for the week of 13 – 20 June, 2018. A Palestinian civilian was killed, and 3 others, including a child, succumbed to their wounds. 8 Palestinian civilians were wounded in the Gaza Strip. 3 Palestinians were wounded in the West Bank. Israeli warplanes carried out many air strikes against many targets belonging to the Palestinian armed groups. Israeli drones targeted the Palestinian civilians gathering in the peaceful demonstrations. Israeli forces launched 54 missiles at military sites belonging to the armed groups and peaceful demonstrators’ gatherings. Two military police officers were wounded when a site near their workplace was targeted. 57 civilians, including 5 children and 2 women, were arrested in the West Bank. 13 of them, including a woman and child, were arrested in Jerusalem. A house was demolished in Qalendia village while doors and barbed wires were uprooted in several neighbourhoods in the city. Israeli forces continued to open fire at the Palestinian fishing boats in the Gaza Sea, but no casualties were reported. 8 Palestinian civilians, including 2 children, were arrested at the military checkpoints in the West Bank. A patient died in Erez Crossing when he was summoned for an interview with the Israeli Intelligence as a condition for giving him a permit to enter Jerusalem for treatment. Israeli violations of international law and international humanitarian law in the oPt continued during the reporting period (13 – 20 June 2018). Israeli forces continued to use lethal force against Palestinian civilians, who participated in peaceful demonstrations organized within the activities of the “Great March of Return and Breaking the Siege” in the Gaza Strip, which witnessed for the 11th week in a row peaceful demonstrations along the eastern and northern Gaza Strip border area. During the reporting period in the Gaza Strip, the Israeli forces killed a Palestinian civilian and 3 others, including a child, succumbed to their wounds. They also wounded 7 other civilians in the Gaza Strip and 3 in the West Bank. The Israeli warplanes carried out several air strikes against targets belonging to the Palestinian armed groups and launched dozens of missiles, causing damage to the sites. 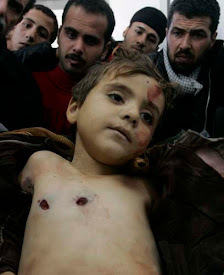 The Israeli drones also targeted Palestinian civilians gathering in the peaceful demonstrations with many missiles. In the Gaza Strip, on 18 June 2018, in use of lethal force, the Israeli forces killed a Palestinian civilian and wounded another. On the same day morning, the Israeli warplanes launched one missile at 4 Palestinians who sneaked into the border fence between the Strip and Israel near the “Karny” Industrial Area in eastern Shija’iyah in eastern Gaza City. As a result, one of them identified as Sabri Abu Khader (23) from al-Tufah neighborhood was killed and another 19-year-old civilian was wounded with shrapnel to the leg. In the same context, two civilians, including a child, succumbed to their wounds. On 14 June, medical sources in the Gaza European Hospital in Khan Younis in the southern Gaza Strip declared death of Ahmed al-‘Aasi (21) from Khan Younis after succumbing to his serious wounds. According to investigations conducted by PCHR at that time, the abovementioned civilian was hit with a gas canister in the head during the demonstrations on Friday, 08 June 2018, east of the Return encampment in Khuza’ah in eastern Khan Younis. On 18 June 2018, medical sources at al-Shifa Hospital in Gaza City declared the death of Zakariah Bushbush (14) from al-Maghazi refugee camp in the central Gaza Strip succumbing to wounds he sustained on 30 May 2018. Zakaria was wounded during his participation in the Return March in eastern al-Bureij with a bullet that entered his chest and exited his back. His condition was very serious so he was transferred to al-Aqsa Martyrs Hospital. On 20 June 2018, Medical sources at St. Josef Hispital in occupied East Jerusalem declared the death of Mohammed Abu Farhanah (23) from ‘Abasan al-Kabirah in Khan Younis in the southern Gaza Strip after succumbing to his serious wounds. The abovementioned was wounded with 2 bullets to the abdomen on 14 May 20118, after the Israeli forces opened fire at him during his participation in the Return March demonstrations in eastern Khan Younis. At that time, he was taken to Nasser Hospital and admitted to the intensive Care Unit (ICU) due to his serious condition. He was later referred to St. Josef Hospital in Jerusalem until his death was declared on the abovementioned day afternoon. During the reporting period, the Israeli forces wounded 7 Palestinians, including 2 military police officers who were wounded when they were in their workplace at the time of targeting the nearby site belonging to the armed groups by the Israeli warplanes. As part of the airstrikes, on 13, 14, 15, 16, 17 and 20 June 2018, the Israeli warplanes launched 15 missiles at the Palestinians participating in the Great March of Return in eastern al-Bureij and al-Maghazi in the central Gaza Strip. Meanwhile, the Israeli soldiers stationed along the border fence between the Gaza Strip and Israel fired live bullets and tear gas canisters at those inside the encampment. As a result, two civilians sustained shrapnel wounds in their bodies. On 17 June 2018, the Israeli warplanes launched 3 missiles at a site belonging to the Palestinian armed groups, southeast of al-Bureij in the central Gaza Strip. On 18 June 2018, Israeli drones fired 3 missiles, 3 minutes between each, at a border control point belonging to the Palestinian armed groups and an agricultural land in Eastern al-Qararah village, northeast of Khan Younis in the southern Gaza Strip. On the same day, an Israeli warplane launched a missile at a Palestinian civilian grey Mitsubishi car parked near al-Murabeteen Mosque at the end of Baghdad Street in al-Shija’yah neighbourhood in eastern Gaza City. On the same day, the Israeli warplanes launched 3 missiles at The Navy Site near al-Shati’ refugee camp, west of Gaza City. In all the airstrikes, no casualties were reported. On the same day, the Israeli warplanes in 4 separate airstrikes launched 7 missiles at 2 sites belonging to al-Qassam Brigades (the military wing of Hamas) in Tal al-Za’atar area in Jabalia and al-Safinah building, southwest of Jabalia in the northern Gaza Strip. On 20 June 2018, the Israeli warplanes launched 3 missiles at a site belonging to the Palestinian armed groups in western al-Maghazi; 2 missiles at another site in western Gaza City; 3 missiles at a military site, east of al-Shaikh Zayed Housing Project in Beit Lahia in the northern Gaza Strip; 6 missiles at Jerusalem Site belonging to al-Qassam Brigdaes, west of Khan Younis; 8 missiles at 2 sites belonging to al-Qassam Brigades, southwest of Rafah City in the southern Gaza Strip. It should be mentioned that the Israeli drones targeted gatherings of Palestinian civilians in the peaceful demonstrations several times, but no casualties were reported. As part of targeting the border areas, on 14 June 2018, the Israeli forces along the border fence between the Gaza Strip and Israel, east of Deir al-Balah in the central Gaza Strip, opened fire at Palestinian agricultural lands adjacent to the border fence. However, no casualties were reported. On 15 June 2018, Israeli forces fired shells at a border control point belonging to the Palestinian armed groups, east of al-Shokah village in eastern Rafah in the southern Gaza Strip. However, no casualties were reported. As part of targeting Palestinian fishermen in the Gaza Sea, the Israeli forces continued to escalate their attacks against the Palestinian fishermen, pointing out to the ongoing Israeli policy of targeting their livelihoods. During the reporting period, PCHR documented 2 shooting incidents at the fishermen sailing off Rafah shore in the southern Gaza Strip. In the West Bank, during the reporting period, the Israeli forces wounded 3 Palestinian civilians. On 15 June 2018, two Palestinians were wounded when the Israeli forces stationed near the military watchtower established on the lands of al-Nabi Saleh village, northwest of Ramallah, fired live bullets and tear gas canisters at them while attempting to cross the main gate closed by the Israeli forces and established at the main entrance to the city. On 19 June 2018, Israeli forces during the reporting period wounded a Palestinian civilian when they moved into the Western Farm village, north of Ramallah and a number of youngsters gathered to protest against their incursion. As a result, the Israeli soldiers opened fire wounding a 21-year-old civilian with a bullet to the abdomen. During the reporting period, Israeli forces conducted at least 58 military incursions into Palestinian communities in the West Bank and 4 similar ones into Jerusalem and its suburbs. During those incursions, Israeli forces arrested at least 44 Palestinians, including 4 children and a woman, in the West Bank. Meanwhile, 13 civilians, including a woman and a child, were arrested in Jerusalem and its suburb. As part of demolishing civilian facilities, on 20 June 2018, the Israeli military vehicles demolished a house in Qalendia village, north of occupied East Jerusalem, under the pretext of non-licensing. The 50-square-meter house which belonged to ‘Ali Mutair was comprised of a room, kitchen and bathroom; and Mutair, his wife and kids moved to live in it only 5 months ago. On the same day, the Israeli municipality staffs carried out a campaign to raid, confiscate and demolish in many areas in occupied east Jerusalem under the pretext of non-licensing. The military vehicles demolished the outside walls, house doors, and removed the perimeter fences of the land belonging to the Islamic Endowments Department in al-Joz Valley neighbourhood. It should be noted that those houses are built on a land which the Israeli forces seek to confiscate in favour of building the Hebrew Biblical Gardens extended to Siwlan village, south of the Jerusalem’s Old City. On 13 June 2018, the Israeli forces confiscated a GCB digger which was reclaiming a land located in Area C according to the 1993 Oslo Accords between ‘Aqraba and Majdal Bani Fadel villages, southeast of Nablus. The land belongs to Ayman Bani Fadel from ‘Aqraba village while the digger belongs to Mohammed ‘Abdel Razzaq Dawoud ‘Odah from nearby Qasrah village. On 14 June 2018, the Israeli forces notified the residents of Qa’oun Plain near Bardala village in the northern Jordan Valley and located in Area C according to the 1993 Oslo Accords to stop working in the Solar Cells Project to supply artesian wells with electricity in the area. It should be mentioned that this project is funded by the Italian GVC. At approximately 02:30, Israeli forces moved into Nemrah neighbourhood in Hebron. They raided and searched a house belonging to Ayman ‘Ashour (17) and then withdrew from the city. It should be noted that ‘Ashour was arrested 3 days ago while he was taking photos in the vicinity of the Ibrahimi Mosque in Hebron’s Old City. At approximately 03:00, Israeli forces accompanied with 2 military vehicles moved into Beit Awla village, west of Hebron. They raided and searched a house belonging to Tareq Ayman ‘Ashour (25) and then arrested him. At approximately 15:30, Israeli drones fired 3 missiles at a group of civilians participating in the Great March of Return, east of al-Buraij in the central Gaza Strip. At approximately 20:00 on the same day, the drone fired 2 other missiles the vicinity of the same area with 45 minutes between the first and second airstrike, causing material damage to the area. Moreover, Israeli soldiers stationed behind the border fence between the Gaza Strip and Israel fired live bullets and tear gas canisters at those who were in the camp. However, no casualties were reported. Note: During the aforementioned day, Israeli forces conducted (6) incursions in the following areas and no arrests were reported: Nuba, Kharas and Halhoul in Hebron. At approximately 01:30, Israeli forces moved into Baqa al-Sharqiyah village, north of Tulkarm. They then raided and searched a house belonging to Khalid Shaher Mohammed Hurani (20) and then arrested him. At approximately 02:00, Israeli forces moved into ‘Aydah refugee camp, north of Bethlehem and stationed on the camp streets. Dozens of youngsters gathered on the street and threw stones and empty bottles at Israeli soldiers. The soldiers heavily fired rubber-coated metal bullets and tear gas canisters at them. As a result, many civilians suffered tear gas inhalation. The soldiers then raided and searched a number of houses and then arrested Ahmed Lutfi Da’amsah (23). They then raided and searched a house belonging to Khader al-Barbari and detained him for some time and then released him after Salem Ahmed al-Barbari turned himself in. The Israeli soldiers also arrested Mo’ath Mohammed Abu ‘Akar (25) for hours and then released him. A number of civilians said that the soldiers raided a barber shop belonging to Wael Jadou, and the shop was full of customers on Eid al Fitr eve. The soldiers locked them inside the shop during the incursion. Around the same time, Israeli forces moved into Jenin refugee camp, west of the city. They raided and searched a number of houses and then arrested Lo’ai Emad Ibrahim ‘Amer (18). At approximately 02:30, Israeli forces moved into Tulkarm. They raided and searched a house belonging to ‘Essam Ahmed As’ad Zablakh (27) and then arrested him. Around the same time, Israeli forces moved into Noor Shams refugee camp, south of Tulkarm. They raided and searched a house belonging to Bara’a Fathi Mohammed Qar’awi (18) and then arrested him. Around the same time, Israeli forces moved into Seneria village, south of Qalqiliyah. They raided and searched a house belonging to Suheib Mashhour A’amar (22) and then arrested him. At approximately 03:00, Israeli forces moved into ‘Aydah refugee camp, north of Bethlehem. They raided and searched 2 houses belonging to Mo’ath Mohammed Abu ‘Aker (25) and Ahmed Mar’ae Da’amsah (23) and then arrested them. At approximately 03:30, Israeli forces moved into Tulkarm. They raided and searched a house belonging to Bashar Sa’aed Ahmed Abu al-‘Ezz (19) and then arrested him. At approximately 14:45, Israeli drones fired a missile at a group of civilians participating in the Great March of Return, east of al-Buraij in the central Gaza Strip. At approximately 15:45 on the same day, the drones fired another missile with 60 minutes between each of the missiles. Moreover, Israeli soldiers stationed behind the border fence between the Gaza Strip and Israel fired live bullets and tear gas canisters at those who were in the camp. However, no casualties were reported. At approximately 19:20, Israeli soldiers stationed behind the border fence between the Gaza Strip and Israel, east of Deir al-Balah in the central Gaza Strip opened fire at agricultural lands adjacent to the border fence. As a result, farmers were forced to leave their lands fearing for their lives, but no casualties were reported. Note: During the aforementioned day, Israeli forces conducted (3) incursions in the following areas and no arrests were reported: al-Laban eastern village, south of Nablus. At approximately 11:10, Israeli forces opened fire at a border control checkpoint belonging to the Palestinian armed groups, east of al-Shawkah village, east of Rafah in the southern Gaza Strip, but no casualties were reported. At approximately 13:30, Israeli drones fired 2 missiles with 10 minutes between each at a group of civilians participating in the Great March of Return, east of al-Buraij in the central Gaza Strip. At approximately 19:55 on the same day, the drones fired another missile at the same area, causing severe damage to the area. Moreover, Israeli soldiers stationed behind the border fence between the Gaza Strip and Israel fired live bullets and tear gas canisters at those who were in the camp. However, no casualties were reported. Note: During the aforementioned day, Israeli forces conducted (9) incursions in the following areas and no arrests were reported: ‘Azzoun village, east of Qalqiliyah; Hebron, Yatta, Halhoul, al-Thaheriyah, al-Samou’a, Ethna, Tarqumiyah and Beit Kahel villages in Hebron. At approximately 15:00, Israeli drones fired a missile at a group of civilians participating in the Great March of Return, east of al-Buraij in the central Gaza Strip. Moreover, Israeli soldiers stationed behind the border fence between the Gaza Strip and Israel fired live bullets and tear gas canisters at those who were in the camp. The airstrike caused the injury of 2 civilians with shrapnel. The wounded civilians were transferred to al-Aqsa Hospital in Deir al-Balah, and Doctors classified their injuries as moderate. At approximately 18:60, Israeli forces moved into Kufor Qaddoum village, northeast of Qalqiliyah. After the end of the weekly protest, they raided and searched a house belonging to Tareq Nabil ‘Ali (14) and then arrested him and took him to a military vehicle. After a short time, Tareq was released, and no further incidents were reported. Note: During the aforementioned day, Israeli forces conducted (3) incursions in the following areas and no arrests were reported: Barta’ah village, southwest of Jenin. At approximately 03:50, Israeli warplanes launched a missile at a Palestinian civilian car that was near Morabeteen Mosque on Baghdad Street in al-Sheja’eiyah neighborhood, east of Gaza City, but no casualties were reported. It should be noted that there were incendiary kites inside the car. At approximately 04:15, Israeli warplanes launched 3 missiles at al-Bahriyah site in al-Shati refugee camp, west of Gaza, but no casualties were reported. At approximately 02:50, Israeli drones fired a missile at a group of civilians participating in the Great March of Return, east of al-Maghazi in the central Gaza Strip. Moreover, Israeli soldiers stationed behind the border fence between the Gaza Strip and Israel fired live bullets and tear gas canisters at those who were in the camp, but no casualties were reported. At approximately 17:30, Israeli drones fired 3 missiles at a site belonging to the Palestinian armed groups, southeast of al-Buraij in the central Gaza Strip. The airstrike caused severe damage to the site, but no casualties were reported. Note: During the aforementioned day, Israeli forces conducted (7) incursions in the following areas and no arrests were reported: Kharas, al-Surrah, Emrish and al-Hadab villages in Hebron. At approximately 01:30, Israeli forces moved into Dura, southwest of Hebron and stationed in al-Namous neighborhood. They raided and searched a house belonging to Mahmoud Mohammed al-Haroub (29) and then arrested him. At approximately 02:00, Israeli forces moved into Hebron and stationed in the southern area. They raided and searched a house belonging to Safa’a Akram Shehdah Abu Suneinah (38) and hen arrested her. It should be noted that Safa’a is the Head of Happy Home Society for Culture and Development in the city. Around the same time, Israeli forces moved into al-Fawar refugee camp, south of Hebron. They raided and searched a house belonging to Anas Nayef al-‘Absi (23) and then arrested him. Around the same time, Israeli forces moved into Taqou’a village, east of Bethlehem. They raided and searched 2 houses belonging to Shadi Nayef al-‘Amour (23) and Yusuf Jamal Sabbah (19) and then arrested them. At approximately 04:20, Israeli drones fired a missile at a military site belonging to al-Qassam Brigades (the Military Armed Wing of Hamas Movement). The site is located where the General Intelligence Services building “al-Safinah” was, southwest of Jabalia in the northern Gaza Strip. After less than 5 minutes, the Israeli warplanes fired 3 other missiles at the same site. The airstrike caused severe damage to the site and partial damage to the houses surrounding the site, but no casualties were reported. At approximately 04:30, Israeli drones fired a missile at a military site belonging to al-Qassam Brigades (the Military Armed wing of Hamas Movement) in Tal al-Za’tar area in Jabalia in the northern Gaza Strip. After less than 5 minutes, the Israeli warplanes launched 2 missiles at the same site, causing material damage to the site, but no casualties were reported. In new use of lethal force, Israeli forces killed a Palestinian civilian and wounded others. According to PCHR’s investigations, at approximately 11:40 on the same day, and Israeli warplane launched 4 missiles at Palestinians who sneaked via the border fence between the Gaza Strip and Israel near the Industrial Area (Karni), east of al-Sheja’eiyah neighborhood, east of Gaza city. As a result, Sabri Ahmed Salah Abu Khader (23) from al-Tuffah neighborhood was killed after being hit with shrapnel throughout his body and a 19-year-old civilian were hit with shrapnel to the legs. At approximately 10:30, Sabri along with 3 others used a cart and went to “Karni” crossing carrying benzene and incendiary materials with them to set fire to a watchtower. The 4 civilians crossed the border fence, but Sabri climbed to the wall to remove the camera on it. Thus, the Israeli warplanes targeted him, so he fled while bleeding and fell on the ground after he crossed the border fence towards the Gaza Strip. At approximately 19:30, Israeli drones fired 3 missiles with few minutes between them at a watchtower belonging to Palestinian armed groups and an agricultural land, east of al-Qararah village, northeast of Khan Younis in the southern Gaza Strip. As a result, airstrike caused material damage in the area, but no casualties were reported. Note: During the aforementioned day, Israeli forces conducted (3) incursions in the following areas and no arrests were reported: Yatta and Beit Kahel and Bani Na’im villages in Hebron. At approximately 01:30, Israeli forces moved into al-Dawhah village, west of Bethlehem and stationed at Chili intersection. They raided and searched a house belonging to Nasser Abu ‘Arab and then arrested his sister’s son Yazan Yusuf al-Bal’awi (22) who according to their claims is wanted. It should be noted that al-Bal’awi is from al-Duheishah refugee camp and the Israeli forces arrested his father Yusuf 2 weeks ago to practice pressure on him so he would turn himself in. At approximately 03:00, Israeli forces moved into Taqou’a village, east of Bethlehem. They raided and searched 2 houses belonging to Shadi Nayef al-‘Amour (23) and Yusuf Jamal Sabbah (19) and then arrested them. At approximately 21:00, Israeli gunboats stationed offshore, west of Rafah in the southern Gaza strip fired flare bombs in the sky and opened fire at a group of Palestinian fishing boats sailing within 3 nautical miles, but no casualties were reported. Note: During the aforementioned day, Israeli forces conducted (3) incursions in the following areas and no arrests were reported: Madama and ‘Asirah al-Qabaliyah villages, south of Nablus; Sanour village, southwest of Jenin; Tulkarm and ‘Azzoun village, east of Qalqiliyah; Kafel Hares village, north of Salfit. At approximately 01:00, Israeli forces moved into Bethlehem and stationed in Hendazah area, east of the city. They raided and searched a house belonging to As’ad Dawoud Abu ‘Ahour (18) and then arrested him. Around the same time, Israeli forces moved into Beit Fajjar village, south of Bethlehem. They raided and searched a house belonging to Ahmed Bassam Deriyah (20) and then arrested him. At approximately 01:15, Israeli forces moved into Nablus. They raided and searched a number of house and then arrested 4 civilians namely yusuf Ahmed Yusuf ‘Awad (22), Mohammed Bilal al-‘Azizi (20), Rami Ahmed al-Kousa (20) and ‘Obadah Khalaf al-Tashtoush (24). At approximately 01:30, Israeli forces moved into Tal village, southwest of Nablus. They raided and searched a number of houses after which they arrested Qusai Hassan Saleh al-Hendi (23) and ‘enad Mustafa Hasan ‘Asidah (22). Around the same time, Israeli forces moved into Jenin refugee camp, west of Jenin. They raided and searched several houses after which they arrested Amir ‘Emad ‘Amer (22), Aysar Mohammed ‘Amer (20) and Ziyad Nasser Ja’as. Around the same time, Israeli forces moved into Kufor ‘Aboush village, south of Tulkarm. They raided and searched a house belonging to ‘Ali Taqi Tawfiq Taqi (28) and then arrested him. At approximately 02:00, Israeli forces move into Thanabah village, east of Tulkarm. They raided and searched a house belonging to ‘Amer Mahmoud Abdullah ‘Assaf (26) and then arrested him. At approximately 02:30, Israeli forces moved into Qifin village, north of Tulkarm. They raided and searched a house belonging to Mo’ath Fathi Raja al-Khasib (28) and then arrested him. Around the same time, Israeli warplanes launched 6 missiles with few minutes at al-Quds site belonging to al-Qassam Brigades (the Military Armed Wing of Hamas Movement), west of al-Satar western neighborhood in Khan Younis in the southern Gaza Strip. As a result, the site sustained large material damage in the area and a guard who works in the area sustained bruises. At approximately 03:45, Israeli warplanes launched 2 missiles at a site belonging to Palestinian armed groups. The airstrike caused material damage to the site, but no casualties were reported. At approximately 04:30, Israeli warplanes launched 3 missiles at a site belonging to Palestinian armed groups, west of al-Maghazi, adjacent to Salah Eden Street in the central Gaza Strip. The airstrike caused material damage to the site, but no casualties were reported. At approximately 04:35, an Israeli drone fired a missile at a military site belonging to al-Qassam Brigades (the Military Armed Wing of Hamas Movement), east of Sheikh Zayed towers in Beit Lahia in the northern Gaza Strip. After less than 5 minutes, the Israeli warplanes fired 2 missiles at the same site, causing severe material damage to the site, but no casualties were reported. At approximately 15:15, Israeli warplanes launched 3 missiles, with few minutes between each, at a site belonging to al-Qassam Brigades (the Military Armed Wing of Hamas Movement), northwest of Rafah in the southern Gaza Strip. The airstrike caused severe damage to the site, but no casualties were reported. At approximately 13:30, an Israeli drone fired a missile at a group of civilians who were in the northeast of Gaza Valley (Juhor al-Deek) in the central Gaza Strip, but no casualties were reported. At approximately 15:30, an Israeli drone fired 2 missiles at a group of civilians who were in the northeast of Gaza Valley (Juhor al-Deek) in the central Gaza Strip, but no casualties were reported. Note: During the aforementioned day, Israeli forces conducted (5) incursions in the following areas and no arrests were reported: ‘Awarta village, southwest of Nablus; Tubas and al-Fare’ah refugee camp, south of the city; Yatta and al-Samou’a village in Hebron. At approximately 13:30 on Friday, 15 June 2018, a group of Palestinian civilians moved from Kufor Qaddoum village, northeast of Qalqiliyah, to the eastern entrance to the village, which has been closed for 15 years in favor of the entrance to “Kedumim” settlement established on the village lands. The protestors chanted national slogans demanding end of occupation, condemning the U.S President Donald Trump’s decision to recognize Jerusalem as the capital of Israel and condemning the Israeli forces’ crimes against Palestinian protestors along the eastern border of the Gaza Strip within “The Great March of Return and Breaking the Siege” activities. The protestors set fire to tires and threw stones at Israeli soldiers stationed behind sand barriers. The soldiers fired rubber bullets, sound bombs and tear gas canisters at them. As a result, many civilians suffered tear gas inhalation. The Israeli forces arrested Hamam ‘Adnan ‘Ali (22) and Omer Walid ‘Ali (20). They also raided and searched 2 houses belonging to Mohammed Tahah ‘Amer and Abdul Rahim ‘Ali and later withdrew. 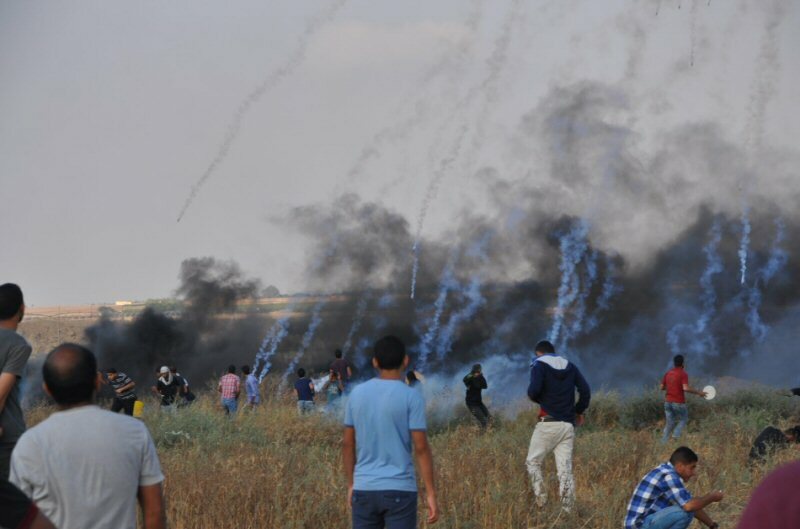 At approximately 14:30 on Sunday, 17 June 2018, Israeli forces stationed behind the border fence between the Gaza Strip and Israel adjacent to the Return camp, east of Khuza’ah village, east of Khan Younis in the southern Gaza Strip, fired live bullets and tear gas canisters at a group of civilians who demonstrated near the border fence. The shooting continued for 3 hours. As a result, a 22-year-old civilian was hit with a live bullet to the hand. He was transferred to Gaza European Hospital to receive medical treatment, and doctors classified his injury as moderate. At approximately 22:30 on the same Sunday, Israeli forces stationed behind the border fence between the Gaza Strip and Israel, east of Abu Safiyah Hill, northeast of Jabalia in the northern Gaza Strip, fired a number of tear gas canisters at civilians who were around 300-600 meters away from the west of the border fence. As a result, a 20-year-old civilian from Jabalia was hit with a tear gas canister to the hand. At approximately 07:30 on Thursday, 14 June 2018, medical sources at Gaza European Hospital in Khan Younis in the southern Gaza Strip, announced the death of Ahmed Ziyad Tawfiq al-‘Asi (21) from Khan Younis refugee camp, succumbing to his wounds. According to PCHR’s investigations, Ahmed was hit with a tear gas canister to the head by Israeli forces during his participation in the Great Return March on 08 June 2018, east of Return camp in Khuza’ah village, east of Khan Younis. He was transferred to Gaza European Hospital where his health condition deteriorated until his death was announced. Moreover, Ziyad Jadallah Abdul Qader al-Braim (28) from Bani Suheila in Khan Younis was killed on the events of the same day after being hit with a live bullet to the abdomen. Moreover, 110 other civilians were wounded. At approximately 16:00 on Monday, 18 June 2018, medical sources at al-Shifa Hospital in Gaza city announced the death of Zakaria Saied Mustafa Bashbash (14) from al-Maghazi refugee camp in the central Gaza Strip, succumbing to wounds he sustained on Wednesday, 30 May 2018. Zakaria was hit with a live bullet that entered the chest and existed from the back during his participation in the Return March, east of al-Buraij. He was admitted to al-Aqsa Hospital as his injury was serious. Zakaria was then transferred to al-Shifa Hospital where he stayed until his death was announced. At approximately 21:45 on Wednesday, 20 June 2018, medical sources at “Mar Youssef” Hospital in East Jerusalem announced the death of Mohammed Ghassan Mohammed Abu Farhanah (23) from ‘Abasan al-Kabirah in Khan Younis in the southern Gaza Strip, succumbing to his serious wounds, east of the city. Mohammed’s father said to PCHR’s fieldworker that Mohammed was hit with 2 live bullets to the abdomen on 14 May 2018 after Israeli forces opened fire at him during his participation in the Return March, east of Khan Younis. He was transfered to Nasser Hospital where he was admitted to the ICUdue to his serious health condition. Mohammed was then referred to “St. Josef” Hospital in Jerusalem where he stayed until his death was announced on the same day evening. According to PCHR’s investigations on the same day events, the Israeli forces killed 19 civilians, including a child, and wounded dozens of civilians, after they used the lethal and excessive force against thousands of peaceful protestors who protested in 3 areas near the border fence between the Gaza Strip and Israel, east of Khan Younis. On Tuesday, 12 June 2018, Israeli authorities allowed one person to travel via Erez Crossing to accompany a dead body. On Tuesday, 12 June 2018, Israeli authorities allowed 3 persons; on Wednesday, 13 June 2018, 5 persons; and on Tuesday, 14 June 2018, one person from the Gaza Strip to perform prayers at al-Aqsa Mosque. On Thursday, 14 June 2018, Israeli authorities allowed 4 persons; and on Monday, 18 June 2018, 2 persons who works at the General Authority of Civil Affairs (GACA) and internationals to renew their permits. On Tuesday, 19 June 2018, Israeli authorities allowed one person to return to the West Bank. At approximately 11:20 on Tuesday, 19 June 2018, Patient Mas’oud ‘Abed al-Hai Mohamed Abu Saqer (49), from Beir al-Na’jah area in Jabalia, north of the Gaza Strip, died at Erez Crossing. Mas’oud had suffered cancer in his right lung since December 2017 and died in Erez Crossing after being summoned for an interview with the Israeli Intelligence Service. Mas’oud Family was informed by the Coordination Department at the Ministry of Heath that Mas’oud should head to the interview in order to get a permit and access al-Motala’ Hospital in occupied Jerusalem. Mas’oud’s brother, Abdullah, said via a phone call that though his brother was asked many times for an interview with the Israeli Intelligence Service, his application was either refused or suspended under the so-called “security check”. As a result, on 21 February 2018, he managed to travel to Egypt, where his right lung was removed in Naser Medical Institute. After that, his health condition deteriorated, especially after returning to Gaza. His family was forced to submit an application to travel via Erez Crossing, but his application was either refused or suspended “under security check”. Mas’oud staued in the Indonesian Hospital in Jabalia until his family was informed that he had an interview at the crossing. On Tuesday, 19 June 2018, he along with his wife headed to the crossing, where he died inside the security corridor connecting between the Israeli and Palestinian sides of the crossing. According to information by the Coordination Department at the Ministry of Health, Mas’oud submitted an application to travel on 02 January 2018, but the Israeli response was that the application is under security check. He went for the interview on 23 January 2018, but the Israeli response came on 30 January 2018 rejecting his application. He also submitted 2 other applications on 28 March 2018 and 23 May 2018, but both were rejected as well. On 06 June 2018, he was asked for an interview with the Israeli Intelligence Service, so he headed to the crossing. However, the Israeli response came on 11 June 2018 that he was under security check. On 19 June 2018, he was asked for an interview with the Israeli Intelligence Service again and headed to the crossing where died. At approximately 20:30 on Tuesday, 19 June 2018, Israeli forces established a checkpoint in the main square of ‘Ain Sinaa village, north of Ramallah. At approximately 23:30, a similar checkpoint was established at the main entrance to ‘Ain Yabroud village, northeast of the city. On Wednesday, 13 June 2018, Israeli forces established 4 checkpoints at the entrances to Yatta, Beit ‘Awaa and Ethna villages and on Karmah-Samou’a Road. On Thursday, 15 June 2018, 3 similar checkpoints were established at the entrances to Dura, Sa’ir and al-Ramadeen villages. On Sunday, 17 June 2018, Israeli forces established 3 checkpoints at the entrance to Beit Ummer village, at the western entrance to Hebron, and at the entrance to al-Fawar refugee camp. On Monday, 18 June 2018, 2 similar checkpoints were established at the entrances to Beit Ummer and al-Shayyoukh villages. On Tuesday, 19 June 2018, Israeli forces established 3 checkpoints at the entrance to Beit ‘Awaa and Jalajel villages and at the southern entrance to Halhoul village. Qalqiliyia: Israeli forces established () checkpoints all over the city. On Thursday, 14 June 2018, Israeli forces established 3 checkpoints at the southern entrance to Qalqiliyia; at the entrances to Jeet and al-Fondoq villages, northeast of the village; and on a road connects between ‘Azoun and Jayyous villages, north of Qalqiliyia. At approximately 12:30 on Friday, 15 June 2018, a checkpoint was established at the eastern entrance to Qalqiliyia. At approximately 20:30 on Saturday, 16 June 2018, Israeli forces established a checkpoint at the entrance to Qalqiliyia. At approximately 21:20 on Sunday, 17 June 2018, a similar checkpoint was established at the entrance to ‘Azoun village, east of Qalqiliyia. At approximately 13:40 on Sunday, a checkpoint was established at the entrance to Heblah village, south of the city. At approximately 19:15 on Monday, 18 June 2018, Israeli forces established a checkpoint beween ‘Azoun and Kafur Thulth villages, east of the city. At approximately 01:50 on Tuesday, 19 June 2018, Israeli forces established a checkpoint at the eastern entrance to Qalqiliyia. At approximately 19:40 on Wednesday, 13 June 2018, Israeli forces established a checkpoint at the western entrance to Qarawet Bani Hassan village,west of Salfit. At approximately 19:45 on Thursday, 14 June 2018, Israeli forces established a checkpoint at the entrance to Qarawet Bani Hassan village, northwest of Salfit. At approximately 21:05, a similar checkpoint was established at the entrance to Kafur al-Deek village, west of the city. At approximately 14:00 on Saturday, 16 June 2018, Israeli forces established a checkpoint in al-Moraba’ah area in a road connects between Tal, Madamah and Bureen villages, south of Nablus. They stopped Palestinian civilians’ vehicles and checked the passengers’ IDs. No more arrests among civilians were reported. On Sunday, 17 June 2018, Israeli forces closed the southern entrance to Nablus, near Hawarah checkpoint, following the gathering of Israeli settlers protesting against vacating an Israeli outpost established in Palestinian civilians’ lands, south of Nablus. Eyewitnesses said that the Israeli forces closed the main Street leading to Nablus, near “Yitzhar” settlement square and Hawarah checkpoint, and prevented the civilians from passing, which caused a traffic jam. At approximately 17:30 on Thursday, 14 June 2018, Israeli forces arrested Waseem Yousef al-‘Alamiy (15), from Wad al-Shaiekh area adjacent to Bypass Road (60), EAST OF Beit Ummer village, north of Hebron. Wassem was arrested while selling fruits and vegetables in front of his family house. At approximately 02:20 on Saturday, 16 June 2018m Israeli forces stationed at Za’tarah checkpoint, south of Nablus, arrested Sa’d ‘Emad Nayif ‘Afouri under the pretext that he had a knife in his bag. At approximately 14:40 on Saturday, Israeli forces established a checkpoint at the entrance to Hawarah village, near “Yitzhar“ settlement intersection. They stopped Palestinian civilians’ vehicles, checked the passengers’ IDs and then arrested 4 civilians, from Jenin. The arrested persons were identified as Mohamed Belel Salah (22), Anas Ahmed Salah (24), Rzafie’ Naseem Salah (22), Ahmed Yousef Salah (23). On the same day, the Israeli forces released 3 of them while Anas Salah is so far under arrest. At approximately 19:30 on Saturday, Israeli forces established a checkpoint at the northern entrance to ‘Azoun village, east of Qalqiliyia. They stopped Palestinian civilians’ vehicles, checked the passengers’ IDs and then arrested 2 civilians, including a child. The arrested persons were identified as ‘Abed al-Kareem Yaser Saleem (16) and Akram Tayseer Saleem (18), both are from ‘Azoun village. ‘Abed al-Kareem and Akram were arrested while returning from ‘Azoun village park and following throwing a Molotov cocktail by unknown persons at settlers vehicles passing through the main street. At approximately 16:00 on Friday, 15 June 2018, Israeli forces arrested a former prisoner No’man Saleh Jum’a al-Najar (24), from Silwad village, northeast of Ramallah, while he was near Bab al-‘Amoud area in occupied East Jerusalem’s Old City. At approximately 00:00 on Monday, 18 June 2018, Israeli forces moved into al-Shaiekh Sa’d village, southeast of occupied East Jerusalem. They raided and searched houses from which they arrested Ahmed Khalil Hasan ‘Owisat (24) and Ahmed Tawfiq Mashahrah (22). At approximately 01:00 on Monday, Israeli forces moved into al-Sawanah village, east of occupied East Jerusalem’s Old City. They raided and searched a house belonging to Ameer Waleed al-Bilbasi (19) and then arrested him. At approximately 02:00 on Monday, Israeli forces moved into Ras Khamis neighborhood near Shu’fat Refugee Camp, north of occupied East Jerusalem’s Old City. They raided and searched a house belonging to Ayham Ahmed Kharashqah (14) and then arrested him. In the evening, a large force of Israeli soldiers and intelligence officers raided Ambassador Hotel in al-Shaiekh Jarrah neighborhood, north of occupied East Jerusalem’s Old City, where there was a ceremony to celebrate the National Day of Russia, and arrested many participants. According to PCHR’s investigations and eyewitnesses’ statements, Israeli intelligence officers raided the abovementioned hotel when the reception started upon an investigation by Russiaa and the Paelstinian-Russian Friendship Society. The Israeli forces prevented holding the ceremony and arrested 6 activists, who were identified as ‘Abed al-Latif Gaith, Rasem ‘Obaidat, Hani al-‘Issawiy, ‘Anan Barakat, Ahmed al-Safadi, and ‘Abeer Abu Khadir. At approximately 14:00 on Thursday, 14 June 2018, Israeli forces arrested Omar Ayham Basem al-Zaghir (20) while getting out of one of al-Aqsa Mosque’s gates in occupied East Jerusalem’s Old City. They then took him to an investigation center for interrogation. On Monday morning, Israeli forces arrested ‘Abdullah Abu Taleb, Head of Guardianship Department at al-Aqsa Mosque. ‘Abdullah is an employee at the Islamic Endowments Department (Awqaf) in Jerusalem and was arrested while he was in Bab al-Rahma area at al-Aqsa Mosque. The Israeli forces also uprooted olive trees planted on Bab al-Rahma Hill, damaged stairs and seats built of al-Aqsa Mosque’s bricks, set up a checkpoint there, and obstructed the guards’ work. It should be noted that a large number of Palestinian young men cleaned Bab al-Rahma area during the past days and established chains, seats, tables, and stairs built of al-Aqsa Mosque’s bricks. At approximately 04:00 on Wednesday, 20 June 2018, Israeli vehicles demolished a house in Qalandia village, north of occupied East Jerusalem, under the pretext of non-licensing. Ra’fat ‘Awadallah, Head of the Village Council, said that the Israeli Civil Administration Department demolished a newly constructed house belonging to ‘Ali Mutair in Qalandia village. He added that the house was comprised of one room with its facilities and built on an area of 50 square meters. The ‘Ali, his wife and their children moved to live in that house only 5 months ago. ‘Awadallah pointed out that Mutair’s house was within the houses notified for demolition in late April as 15 houses, including 3 houses that should be immediately demolished, were notified. On 24 March 2018, the Israeli Civil Administration staff accompanied with military patrols took Geographical surveys for residential facilities in Qalandia. They also notified the owners of 10 buildings in order to demolish them and summoned the owners for interrogation on grounds of illegal construction. At approximately 08:00 on Wednesday, the Israeli Municipality crews carried out raid, confiscation and demolition campaigns in many areas in occupied East Jerusalem under the pretext of non-licensing. Jerusalemite Activist Redwan ‘Amr said that the Israeli vehicles accompanied with Israeli forces moved into the vicinity of his relatives’ houses in Wad al-Jouz neighborhood in occupied Jerusalem and damaged the contents. He added that the Israeli vehicles demolished the outside walls and houses’ doors in addition to removing the perimeter fences of the land belonging to the Islamic Endowment Department. It should be noted that these houses are built on a plot of land that the Israeli authorities seek to confiscate it in order to build Biblical Gardens extended to Silwan village, south of occupied Jerusalem’s Old City. Palestinian buses that weekly carry Palestinians from for praying at al-Aqsa Mosque parked in this area because there were no other parking plots for these buses. Due to this, the Israeli authorities imposed fines on the buses. Moreover, the Israeli Municipality staff removed steel doors of a commercial facility “store” belonging to Abu Hadwan Family and confiscated them in Silwan village. At approximately 11:30 on Wednesday, 13 June 2018, Israeli forces accompanied with a vehicle of the Israeli Civil Administration moved into Kafur ‘Atayiah area, south of ‘Aqrabah village, southeast of Nablus, classified as Area C according to the Oslo Accords. The Israeli forces confiscated a digger that was reclaiming a plot of land between ‘Aqrabah and Majdal Bani Fadel villages. The plot of land belongs to Ayman Bani Fadel, from ‘Aqrabah village, while the digger belongs to Mohamed ‘Abed al-Razeq Dawoud ‘Odah, from Qasrah village, southeast of Nablus. On Thursday, 14 June 2018, Israeli forces accompanied with a vehicle of the Israeli Civil Administration moved into Qa’oun Plain near Bardlah village in Jordan Valley classified as Area C according to the Oslo Accords. The Israeli Civil Administration notified the village residents to stop working in the solar cells project in the area. It should be noted that the project is funded by the Italian Civil Volunteer Group (GVC).